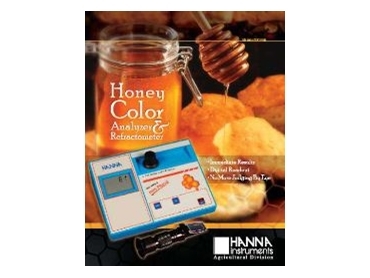 HANNA Instruments has introduced the C221 honey colour analyser. The analyser eliminates judging by the eye. The primary characteristic for commercial honey classification is colour. Honey colour varies naturally in a wide range of tonalities, ranging from light yellow to amber, dark amber and black in extreme cases. The C221 portable microprocessor analyser measures the percentage light transmittance of honey colour compared to analytical reagent grade glycerol. The transmittance value allows identification of the honey Pfund grade. The instrument directly displays the measurement result expressed in millimetres (mm) Pfund. The C221 honey colour analyser gives an immediate digital readout of results. This instrument operates in the range of 0 to 150mm Pfund with an accuracy of ±2mm Pfund. The C221 features auto shut off. The C221 honey colour analyser is supplied complete with five sample cuvets, one light shield cap, 30mL glycerol, 9V batteries, 12V dc transformer, and an instruction manual. The recommended accessories include the C219KITN which consists of 30mL glycerol, 82 matched square cuvets and 2 x 5mL syringes.